Senior Advantage Magazine provides health information, safety tips and other information that can help enhance the health and well being of adults age 65 and older. 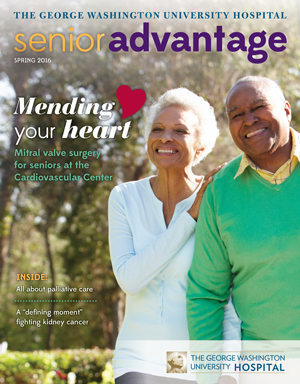 The print version of Senior Advantage is mailed twice a year to members of The George Washington University Hospital's Senior Advantage program. Just about anyone with a serious illness can benefit from palliative care and the supportive experience it can provide. Danielle J. Doberman, MD, MPH, Director of the Palliative Medicine Program at GW Hospital, talks about palliative care. Nearly 800,000 people have a stroke each year, and someone in the United States has a stroke every 40 seconds. * To help prevent a stroke from happening, know your risk factors and take steps to control them. Surgeons at the Cardiovascular Center offer more options for senior patients with mitral regurgitation. "GW Hospital gave me hope -- the best medicine." Patti Luzi.